Macro Jets launches New Business Jet Sales Brokerage with Gulfstream G650, Boeing 737 BBJ VIP & Global Express aircraft for sale. Macro Jets launches Brokerage to assist high-net-worth individuals and large corporations with their new turn key model for aircraft ownership without any annual costs. How is this possible, Macro Jets has developed a way. 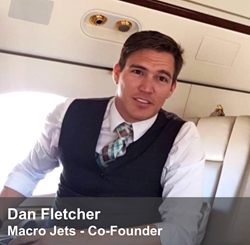 How to own a private jet without any annual costs, Macro Jets has developed a way! Due to the growth of Macro Jets and market conditions, the innovative global on-demand private jet chartering company recently announced a dedicated sales division aimed at facilitating the process of acquiring light, mid, heavy & jumbo size business jets. The new division has launched with a 2016 Gulfstream G650, Boeing 737 BBJ VIP & Global Express aircraft among others available for sale. Numerous charter clients have shown a strong interest in aircraft ownership once they understood the model and strategic partnerships which Macro Jets has secured. “With the innovation in technology and our numerous new partnerships, we are now able to purchase a second hand aircraft, refurbish as its brand new, add to a charter certificate and manage the aircraft to cover the annual costs of ownership. On top of that, our tax advisors are the best in the business and will guide the purchaser to take full advantage of the great tax depreciation incentives that come along with purchasing an aircraft, such as being able to depreciate 52% of the purchase price within the first two years. We offer a turnkey solution for anyone interested in aircraft ownership.” Recently said in an interview with, Dan Fletcher. Macro Jets will continue to deliver an innovative approach to private jet sales in a similar fashion as they have with their global on-demand private jet chartering services and Global Empty Legs. With a large established global network of clients, Macro Jets offers a wide range of options for prospective buyers and goes beyond merely the acquisition phase of the process. Macro Jets is a one stop shop for anyone considering purchasing an aircraft. Macro Jets has a vast network at their disposal allowing clients the opportunity to find the perfect business jet to suit their needs. In addition to sourcing the right aircraft, Macro Jets will also advise their clients and be involved throughout the entire transaction process. From choosing the best financing option, selecting the best management company and guiding the purchaser throughout the entire refurbishment process. Macro Jets will continue to innovate and evolve into the global aviation brand it was destined to be.